Upcycled Plastic Bottles Are Green & Funktional! There’s really no need to prattle on about how purposeful it is to recycle. It’s just so obvious on so many levels. Besides being green and respectful of “Mom” (Mother Earth, that is. ), today’s blog niftily illustrates how fun, funky and functional upcycling plastic bottles can really be. This is post contains an affiliate link. [Upcycled] Table Lamps (top two photos): There’s just something so sweet and smart about these easy-to- identify-where-they-came-from lamps. The artist is not only making green fashionable, he’s making plain ol’ “green”…dollars that is! Price for these funktionally upcylced lamps is $185 a piece. 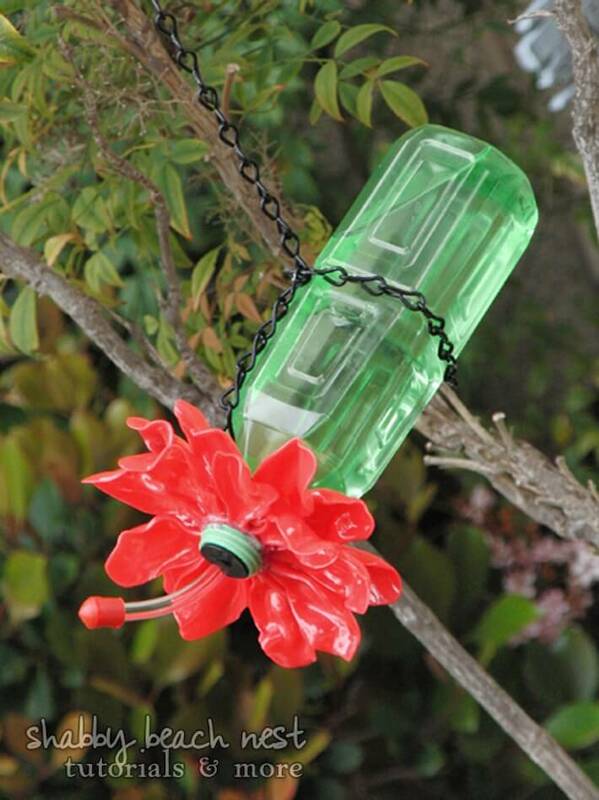 [Upcycled] Bird Feeder: made out of a sleek, green plastic bottle and adorned with red plastic, melted spoons, and a feeding tube stopper, what hummingbird wouldn’t want to take a sip from this beautiful earth-friendly feeder? [Upcycled] Office Wall Dividers: fish line and a whole lotta clear plastic bottles were strung together to create these modern and sculptural wall dividers. The vessels’ ridges also cleverly reflect light and color adding dimension and an imagined sense of privacy. Green nerds rule. [Upcycled] Greenhouse: for a year and a half, kids from the Mill Lane School in Chinnor, Oxfordshire collected 1,500 plastic bottles and then built this fabulous greenhouse by nailing the bottles to this wooden frame. By the looks of their tomatoes, it works quite well. [Upcycled] Sofas & Chair: this real and functional furniture set was made completely out of clear plastic bottles. Banded together, their strength and form is surprising.